"In terms of second installments in trilogies, The Two Towers serves as a fantastic medium for the Lord of the Rings films." Unlike immensely popular trilogies come before, Peter Jackson's astounding Lord of the Rings trilogy premiered all 3 films within 3 years, each within a single year of each other, all thanks to extensive planning conducted before the end of the 20th century, in the late 1990's. Jackson's Fellowship of the Ring was met with an abundance of critical and commercial success, and so therefore audiences were delighted to be back in Middle Earth only a year after since least venturing to the magical and awe inspiring location. The Two Towers was released out to a greater quantity of critical success, it seemed, as well as grossing near $55 million more than the prior installment into the trilogy. Unlike Fellowship of the Ring, which focused a deal less on the grand spectacle, and more on intimate and character-driven moments, The Two Towers began to push the bar in the way of large scale battle sequences, which are still heralded as some of the most flawlessly executed, even to this day. Though despite this step up in spectacle, the wonderfully acted and written characters drove this film, with Gollum being the most notable and impressive; Andy Serkis's performance as the twisted and broken creature Sméagol, who is known as Gollum for the vast majority of his screen time is a brilliant display of skill in the area of motion capture, and many still yearn for Serkis to be acknowledged by the Academy for his efforts. With a darker and more tonally jumbled canvas compared to the first film, Howard Shore's composition work needed to inspire a darker mood than the original, and so his efforts realigned with this desired outcome. After the pristine release that was The Lord of the Rings: The Fellowship of the Ring score, pressure was settled upon Shore to deliver another outstanding piece of work for the next installment into the trilogy, and so the already blistering task that was composing an additional 3 hours of music for the next film in the Lord of the Rings franchise, was now proven more tiring, thanks to the reception of the first score, and the desire from those who wished to see more outstanding music; they would not be sated until an album that lived up to the first was presented before them. 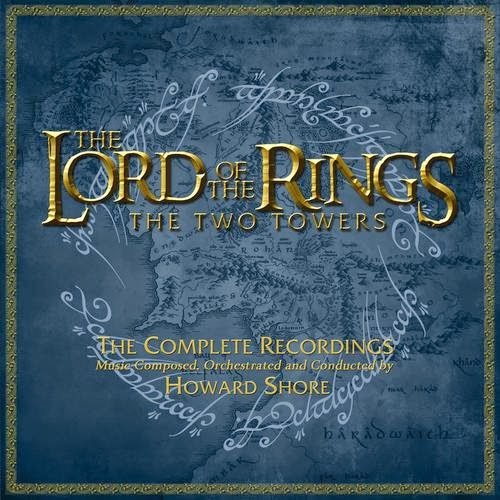 So, with Shore under a ridiculous amount of pressure from both producers, director, and the public, The Lord of the Rings: The Two Towers score was constructed carefully and masterfully by Shore, performed by The London Philharmonic Orchestra, and released to the public in 2002 with limited and regular releases to be found, and then later in 2006, as a complete edition. Let us explore the utter brilliance that is The Two Towers, with all these albums in mind. To begin with, the 2002 releases, both limited and regular. Fellowship of the Ring came under partial scrutiny from multiple credible review sources, most notably Filmtracks, for it's arrangement for the 2001 initial releases, both regular and limited. The most notable issue found is the handling of publicity for both releases, and the fluctuated price for the limited release, despite the lack of anything really new for this separate album. Whilst I'm not necessarily one to be irritated by anything sale-wise, and prefer to focus solely on the music's credibility, this atrocious handling of the releases really does deserve mention. Fortunately, The Two Towers does offer a somewhat better limited release; an additional cue is provided, that being Farewell To Lorien, which sits at a 4:39 minute running time, which seems quite unfair, considering the minor extra cost that will need to be dealt with, simply for such an averagely timed piece. Nonetheless, whether you purchase the limited album or the regular album, you shall not have wasted money, for The Lord of the Rings: The Two Towers is an utterly splendid listening experience. Whilst not as boastful and thematically adorned as Fellowship, as may well have been the intention of Shore, The Two Towers serves as an incredibly beautiful 2nd installment in the Lord of the Rings franchise. Presenting a vast number of new thematic ideas for newly introduced characters and locations, this score both revisits the prior installment in the series, whilst establishing all new material. The most splendid of such new themes has to be the Rohan theme, the closest thing to the epic grandeur we received in Fellowship that seems somewhat absent here in this purposefully muddy and toned down album. Used gracefully all throughout the score, Shore utilizes one of his finest thematic ideas constantly, with different instrumentation and pace becoming the flagship. At some points, the Rohan theme announces itself as a fanfare, with brass blazing on, whilst at other periods, the hardanger fiddle performs the theme with a Scottish edge, which represents Rohan perfectly; unlike Gondor, Rohan is seen as much more rural and expansive within the film, and so therefore it required a much more rustic theme. Part from this glorious piece of thematic ingenuity though, and it seems The Two Towers' constantly adds more edge and atmosphere to the already atmosphere-driven project. Less obvious leitmotifs are presented within this release, and so for intellectual purposes, this may be above and beyond Fellowship of the Ring in that retrospect. As a whole, The Two Towers' 2002 releases stand up as thrilling, passionate, and more chaotic than the prior release. It was a brave decision for Shore to take a less obvious route with the thematic material, and set course for a less distinct quality and sound, though it certainly pays off as a listening experience. I find it surprising though that I do find this as an effective and enjoyable listening experience, seeing as 11 years after the release of this album, The Hobbit: The Desolation of Smaug was released, and it seemed to have taken the same route as it's middle-trilogy counter part in The Two Towers, except without near as much success in my case. The darker tone is visible in both products, though Shore seems to have collated a much smoother and enjoyable set of music for the latter album, The Two Towers, compared to the former, which seemed oddly less impressive than anything else Shore had contributed to the franchises, both The Hobbit and The Lord of the Rings. Desolation of Smaug provided a number of impressive thematic ideas, however unnoticeable, allowed the overall mood to dip significantly, and seemed to have paid more notice to the choral aspect of the music, though the result was not nearly as enjoyable as the album we're discussing here today. Both albums I found oddly non-compelling from the first listen through, though my taste improved significantly for both albums over time. By the third listen through of The Two Towers, I was thoroughly engaged with what Shore had provided, and agreed with those hailing this as another masterpiece from Shore. Desolation of Smaug, on the other hand, despite my growing enjoyment of the score, could not live up to my exceedingly high expectations, even after 6 listens, and an uncountable amount of revisits to individual cues. Not even the ridiculously enjoyable Lake-Town theme could sate my desire for more. The Two Towers provides enjoyable cue after enjoyable cue, whilst appealing to the darker approach that the film so heavily required, and that's what makes it stand tall above Desolation of Smaug. Whilst Shore has taken measures to refrain from allowing obvious thematic material to shine through over muddied presentation and fantastically gritty battle cues, he does allow some callbacks to the prior score in the trilogy to make themselves known. The Fellowship theme is heard faintly throughout the score, sparingly for the most part, as is the Shire theme, among other less obvious leitmotifs, which all make returns from the prior score. It ties The Two Towers and Fellowship of the Ring together, after so much difference can be established between the two scores. This second score though is very much a middle score in a trilogy, and that is what most plainly distinguishes it from the first score in the saga, so Shore's decision to under use the preexisting material is a smart move; this allows the score to leave many roads unfinished, all of which will conclude in Return of the King. This is even discernible in the sometimes jagged 2002 releases, which is a testament to Shore's dedication to new principles and themes. Quite a bit of the music doesn't seem to any resolve, though this doesn't pose too much a problem thematically or melody-wise, thanks to Shore's resounding conclusions, that wrap up with careful consideration for what we're soon to receive in the next addition to the story. The dark and twisted plot that has been Sam and Frodo's journey, now along with the evil Gollum, whose theme, like I've mentioned, is barely distinguishable, concludes within The Two Towers on a lighter note; the cue Samwise the Brave obviously represents the still lingering friendship between the two main characters, Frodo and Sam. Unlike the rest of the score, the characters are aloud to conclude for this film in a steady, safe way, so this can be discerned as a conclusion, that whilst still leaving ideas and routes open, does solidly close the story for now in a satisfying manner. This is not the case though for all plot lines and thematic ideas, both old and new; for the Isengard and Ent material, the 2002 releases end this significant plot in the cue Isengard Unleashed, which never seems to properly resolve. The cue is heavy handed and ends off the top of a choral high point; we can't be expected to believe this is the album's ending to such an important factor in the overall story! Whilst for the most part, the 2002 albums did manage in concluding the story for the time being in a solid and respectable manner, they did fail some major areas of the film in conclusions; whilst yes, we did find that Shore executed these characters and plot lines' endings correctly in the complete edition, a wait worth 4 years between said release and the 2002 limited and regular releases isn't efficient. Nonetheless, The Two Towers still stands tall as an utterly beautiful example of fantasy music made right. Whilst Fellowship of the Ring seemed to adhere to the stereotypes associated with the genre it was placed in, by promising and giving grandiose and extravagant orchestral themes, The Two Towers detaches itself from these stereotypes, and instead excels in subtlety and intelligence. That phrase is commonly overused within the musical world, but here, it is completely necessary, because that's what this score is capable of being, and is; intelligent. Shore is aware of everything he needs to cater towards, and allows the music to bend to the will of the film and story, which in this case isn't necessarily a negative. Being that the films were so rich in spectacle and fantastic characters, it's almost no surprise that Shore managed to create something transcendent over anything else in the fantasy genre that has been seen before. Yet we still marvel over it, because it's a creation that is unmatched in it's own genre, nor in any other genre. And speaking less as someone who is critiquing the movie, and more speaking like a fan, someone whom I'm sure I relate to more as, this score is awesome. Quite literally. I'm in awe of the battle cues, the complex melodies to be found all throughout, the soothing and ever-flowing instrumentation that never ceases to remain enjoyable, and the character of the score in of itself. I can listen to this album of highlights over and over again and never get bored, despite my slight issue with the conclusion to some of various plot lines. And even that issue is not necessarily the fault of Shore, more so those who put this commercial album out to the public. No matter your issues with the album/s themselves, you can not fault a single one of Shore's cues here, for they are all spotless. If a 3 hour long complete edition doesn't appeal to you, then this album should serve you very well, in any case. After The Fellowship of the Ring received an outstanding complete edition in 2005, to allow any fans yearning for extra music to sate their growing infuriation with the lack of additional releases, The Two Towers found itself with a wonderful complete edition, released in the year 2006 to fan approval. Clocking in at a staggering 3 hours and 12 minutes, the comparison between the two released complete editions shows much the same thing as the initially released commercial editions. 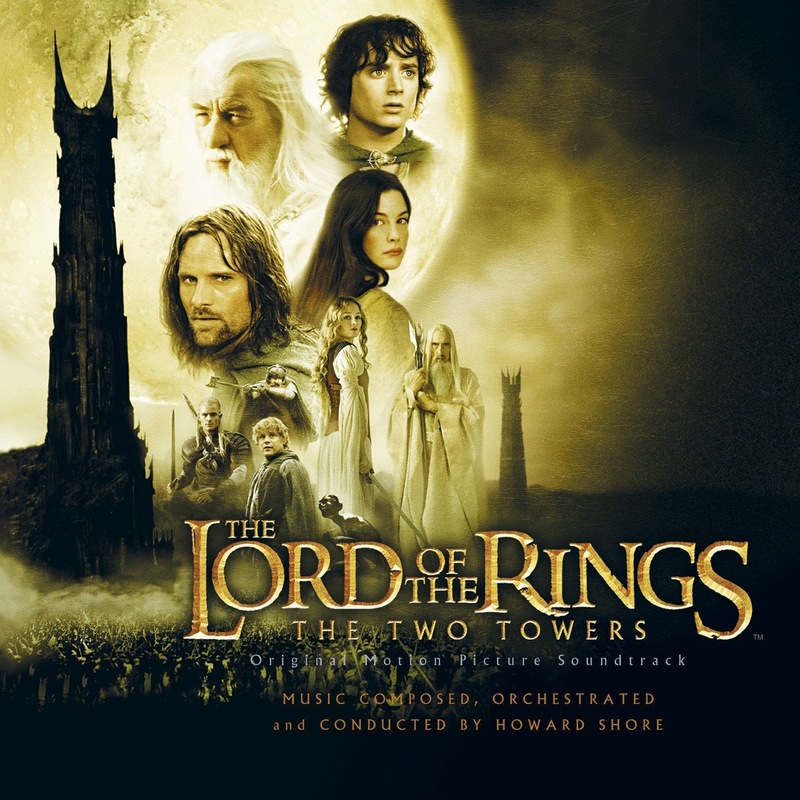 The first score in the trilogy, whether or not you were listening to the 72 minute long initial release or complete edition, very much contained the spectacle and emotional complexity that makes Fellowship of the Ring so damn enjoyable, whilst The Two Towers is much a different story, with both initial and completed scores exploring much more obscure territory, as well as engaging in much less heroic and defining battle cues, which focused much more on the peril and and intricate detailing than the previous endeavour into the action forte. So, if the conclusion seems to be somewhat the same as the prior discussion on the 2002 releases, do you really need to purchase this additional content? The answer to that question is a definitive yes. Utterly brilliant in presentation, and filled to the brim with fantastic content that will have you re-exploring every little motif possible, the complete edition for The Two Towers is as worthwhile as The Fellowship of the Ring complete edition. Re-exploration is much more prominent in the complete edition than was found in the 2002 releases, and whilst this may somewhat undermine the individuality of the score in it's own right, this can be dismissed, seeing as there are a whole 3 hours of music to cover. The album opens with a direct call back, that being to the Prologue cue in The Fellowship of the Ring; the first cue of The Two Towers complete edition happens to fasten in the thematic material used in the opening cue to the prior complete edition, the History of the Ring theme, which is harrowing to say the least. Before long, the complete edition gifts us a proper chance at a listen to Gollum's theme; the cimbalom makes an almost completely indistinct appearance, that you can very well miss if you're not paying attention. Even in the complete edition setting, Gollum's theme is never really distinct nor predictable, as is intended by Shore. The creature of Gollum is made to be completely unpredictable and sly; in fact, that is part of his character. Shore's theme for Gollum first appears within the third cue of the first disc, Eymn Muil, and then upgrades to a full blown extravaganza in My Precious, all impressive cues. Not soon later, the theme for the Fellowship makes it's biggest and most distinct appearance, within The Three Hunters, a 6 minute long piece of magic. Also to accompany the Fellowship's glorious theme is one of my favourite thematic ideas in the entire trilogy; Isengard. An extended Isengard and Mordor showcase allows this cue a distinct battle in material; the light and heroic tone is quickly undermined by the evil and booming thematic material instilled within the darker characters. The length of this glorious cue also allows me thought on this complete edition and it's length; what these complete editions allow you to appreciate most is not necessarily the sheer amount of cues provided, but more so the opposite. The fact that for 3 hours worth of music, we only find ourselves with 45 cues in hand is quite impressive, in my mind. Shore certainly takes no time for granted, and puts to work ideas and concepts at every bidding opportunity. Continuing on with my praise for this extended collection, I'd like to point your eyes towards the cue The Banishment of Eomer. Whilst there occurs an early version for the theme for Eomer, and a brief Fellowship theme cameo, the majority of this cue avoids thematic inspiration. Instead, Shore decides to dedicate resources towards fleshing out Rohan's musical philosophy, and it's sound in general; open harmonies and low voiced brass and strings. This is one of the fantastic things existing within The Two Towers, that seemed lacking in The Fellowship of the Ring; the need of identity for locations. Whilst I do prefer Fellowship of the Ring, you can't deny that The Two Towers establishes locations, characters, and tone much better than the prior score in the trilogy. Though, the question exists; does the complete edition ever tire? It all depends on a matter of preference, I believe, as was the case with The Fellowship of the Ring. My attention span seems to have lengthened slightly over the past few months, and it seems I can manage the grueling 3 hour expedition to Middle-Earth for The Two Towers complete edition. If you can't keep your attention locked into the music for a full 3 hours, though, it's completely understandable. Personally, The Two Towers exists as a better complete edition, again, compared to The Fellowship of the Ring. It's more exciting, engrossing, tense, and intelligent than it's predecessor, and for me at least, that makes for a better 3 hour long experience. There are low points, boring points, and somewhat pointless points, but pushing past these allows for some of the most flawless and jaw dropping musical moments of your life. Taking into account the amount of vast space needed to be covered by a single score, composed, conducted and produced by a single man (officially), Shore has managed to take some broad material, and weave it into a single, coherent product, as was the case for The Fellowship of the Ring. Musical continuity seems to be the main ideal behind all 3 of these scores, and from piece to piece, whether it be the introduction of the theme to the Ents to the methodical, slow and aggressive cue The Dead Marshes, everything feels as if there is a common flow, which makes listening to this ever simple. It's this continuity and same tone that Shore establishes throughout that allows all areas of Middle Earth to be connected under the same banner, foreign and wide that all these areas are. The Isengard and Mordor theme are slightly more prominent together than in the last film, Elvish material is sighted within darker, brass filled riffs, and Gollum and The Ring's themes both have significant likeness, deliberately of course. Shore's attempts to combine various individual melodies into a single, sole idea is one of the benefits in the subtlety that is provided within the score. Shore subtly hints at two concepts being connected, whether it be by instrumentation, joining of two motifs, or by just plain taking both leitmotifs and conjoining them within a piece. Shore's acceptance that a lot of the elements of the score happen to be inter-connected, happens to be one of the shining elements of the complete edition. This is a foreign, huge world, with lots of different cultures coming together for battle, politics, war, and so taking the themes, taking what makes these locations and character themselves and infusing them into other character and location driven cues allows for resemblances to be drawn, and for this impending war to be traversed with logic and musical coherency. The darker characters join together, the allies whom we're supporting make means to join forces, and Frodo and Sam are having to deal with a mean, evil little creature in Gollum that draws semblance to the Ring and Mordor. It's an intelligent musical concept that Shore has developed to outstanding result. In conclusion, Howard Shore's The Lord of the Rings: The Two Towers is one of the best film scores of all time, though not the strongest in the Lord of the Rings trilogy, riding just behind Fellowship of the Ring, in my opinion. It's muddied presentation will warrant criticism from those who wish for something more pure and straight forward from such a score, though this is unfair. The film that Shore has taken to composing for has a much more muddied canvas, with plot lines occurring all over the continent, all stretched between hundreds of miles. To not only develop, record, and edit such a beast of a score, with so many individual and diverse motifs and phrases, more so than the prior score in the franchise, is a mammoth task, made harder by the fact that this score was having to be completed only a year after the first was premiered. Whether or not you agree with the collective consensus that these scores are utterly pristine in presentation and conceptualisation, you should be able to appreciate the amount of effort poured into these scores, this one in particular. Without a real foothold, no proper beginning or ending to the story, Shore has still managed to develop a score with impressive scope, unparalleled instrumentation, and composition that varies in pace, tone, and generics at every opportunity possible. I don't believe there really is anything to compare to The Lord of the Rings trilogy of scores, and there really is nothing to compare to The Lord of the Rings: The Two Towers, both complete and 2002 releases. It's only my personal preference that has me favoring Fellowship of the Ring, at this point, but if you take this score over said release, no one would argue with your stance. The Two Towers is the most impressive fantasy score in history, though not the best. Make no doubt about it though, this score is worth time, money, and dedication. You can purchase the regular and limited 2002 releases here and here, and the complete edition of the score on Amazon here. 3. Where is the Horse and the Rider?